The federal farm bill is scheduled for reauthorization in 2018. 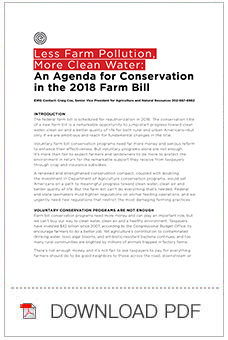 The conservation title of a new farm bill is a remarkable opportunity to jump-start progress toward clean water, clean air, and a better quality of life for both rural and urban Americans – but only if we are ambitious and reach for fundamental changes in the title. Voluntary farm bill conservation programs need far more money and serious reform to enhance their effectiveness. But voluntary programs alone are not enough. It’s more than fair to expect farmers and landowners to do more to protect the environment in return for the remarkable support they receive from taxpayers through crop and insurance subsidies. A renewed and strengthened conservation compact, coupled with doubling the investment in Department of Agriculture conservation programs, would set Americans on a path to meaningful progress toward clean water, clean air and better quality of life. But the farm bill can’t do everything that’s needed. Federal and state lawmakers must tighten regulations on animal feeding operations, and we urgently need new regulations that restrict the most damaging farming practices. Farm bill conservation programs need more money and can play an important role, but we can’t buy our way to clean water, clean air and a healthy environment. Taxpayers have invested $42 billion since 2007, according to the Congressional Budget Office, to encourage farmers to do a better job. Yet agriculture’s contribution to contaminated drinking water, toxic algal blooms, and antibiotic-resistant bacteria continues, and too many rural communities are blighted by millions of animals trapped in factory farms. There’s not enough money and it’s not fair to ask taxpayers to pay for everything farmers should do to be good neighbors to those across the road, downstream or downwind. Moreover, if farmers voluntarily implement a conservation practice, they can also voluntarily stop using that practice. As a result, conservation practices come and go, and we end up spinning our wheels while spending billions. Farmers and landowners should be expected to implement and maintain a set of basic measures to protect public health and the environment. Thankfully, some states are acting to restrict disproportionally damaging farming practices and set standards that farmers should be expected to meet. But we need more. A renewed commitment to a stronger conservation compact between farmers and taxpayers in the farm bill is the single best opportunity at the federal level to ensure that common-sense – but critical – conservation practices stay in place on cropland across the nation. It’s more than fair to expect farmers and landowners to expand their efforts to protect the environment in return for generous farm and insurance subsidies they receive – $14.5 billion in 2016 alone, according to the Congressional Budget Office. The CBO projects those subsidies will cost taxpayers another $64.3 billion over the next five years. Most of that goes to complex farming operations and households making more than $250,000 a year – a far cry from the struggling family farms taxpayers are told they are helping. The conservation compact between farmers and taxpayers enacted in 1985 sparked dramatic progress in cutting runoff from the most vulnerable cropland and saving wetlands. Now it’s time to require all subsidized growers and all the cropland they farm to meet common-sense and easily implemented conservation standards to cut polluted runoff, and protect soil and clean air. It’s also past time for the USDA to meet its responsibility of ensuring those requirements are met. A new and stronger conservation compact will be a fairer deal for taxpayers, a level playing field for conservation-minded farmers and the foundation on which a more effective conservation title can be built. 1. Require farmers and landowners to plan and fully apply an approved conservation system on all annually tilled cropland in order to remain eligible for farm program benefits and crop insurance premium subsidies. Achieves a rate of soil erosion no greater than the soil loss tolerance level on all annually planted cropland. Establishes and maintains a minimum of 50 feet of perennial vegetation between annually tilled cropland and intermittent or perennial waterways. 3. Provide annual funding for technical assistance, conducting status reviews and completing other tasks required to fully implement the new compact. This annual amount should be equal to 0.02 percent of the funding otherwise provided through farm program and crop insurance premium subsidies, not to exceed $300 million. 4. Mandate annual reviews of compliance status with the approved conservation system on no less than 5 percent of the tracts subject to the quid pro quo. 5. Require farmers and landowners to have an approved conservation system plan within five years of enactment and to fully apply the approved system within 10 years of enactment. According to the Congressional Budget Office, in 2016 a total of $4.6 billion was spent through all USDA conservation programs – this was 32 percent of what was spent on farm and insurance subsidies that year. This was far less than the investment needed to make meaningful progress toward clean water, clean air, and better quality of life for rural and urban Americans. If taxpayers in Iowa are expected to pay for everything farmers should do to cut fertilizer and manure runoff, it will cost between $800 million and $1.2 billion a year, according to Iowa’s Nutrient Reduction Strategy. That’s over 10 times as much as the $62 million allocated to the Environmental Quality Incentives Program, or EQIP, and the Conservation Stewardship Program in Iowa in 2016. A report prepared for the USDA’s Office of the Chief Economist estimated that the cost of implementing all agricultural best management practices needed to save the Chesapeake Bay would be $3.6 billion between 2011 and 2025, in 2010 dollars, plus another $900 million a year from 2025 onward. The returns on increased investment, however, are enormous. A 2011 study by the USDA’s Economic Research Service concluded that it costs $1.7 billion a year to treat drinking water contaminated by nitrates from farm fields. But cutting nitrates in source water by just 1 percent would decrease treatment costs by over $120 million a year. A 2015 study found that potential health and environmental damages from nitrogen lost from farm fields cost $157 billion a year. And according to the Environmental Protection Agency, the tourism industry loses close to $1 billion each year because of water bodies affected by nutrient pollution and harmful algal blooms. The Congressional Budget Office projects that, under current law, funding for conservation title programs will reach nearly $6 billion by 2022, and spend about $29 billion between 2018 and 2022. If we are going to rely heavily on voluntary conservation programs to meet the public health and quality of life challenges facing agriculture, Congress must dramatically increase funding for the conservation title. Congress should ramp up funding for the conservation title beginning in 2018 to achieve $12 billion annually by 2022 – twice the annual funding projected by the CBO for that year. EWG’s Conservation Database provides a detailed look at how conservation dollars have been spent at the county level across the nation. Even a cursory look at the data shows that there are tremendous opportunities to improve the performance of these programs and deliver more to the taxpayers footing the bill. Congress must ramp up funding for these programs, but at the same time must take steps to get more out of every dollar taxpayers invest. 1. Ensuring drinking water is clean, safe and abundant by keeping fertilizers, manure, pesticides and mud out of source water and curbing unsustainable use of water for irrigating crops. 2. Cleaning up toxic lakes and polluted streams that are too dangerous or too repellent for families looking to take a swim, float downstream or fish. 3. Cutting the huge doses of pesticides sprayed on farm fields and crops that end up on our food, in our water and in the air we breathe. 4. Clamping down on water and air pollution from animals raised on factory farms. USDA programs should help farmers move away from raising livestock in confinements. Farmers and landowners should be willing to pick up the cost of practices whose primary effects are increasing their own productivity and profits. 1. Sixty percent from the Environmental Quality Incentives Program and the Conservation Stewardship Program to help producers implement conservation practices and activities that enhance the quality and quantity of source water and the recreational value of lakes, rivers and streams. 2. Fifteen percent each from EQIP and CSP to help producers reduce the need for pesticides, including transition to organic farming and implementation of ecologically based intensive integrated pest management. 3. Ten percent from EQIP to help producers reduce the need for antibiotic use in livestock production. The new farm bill should also provide $300 million annually to the Regional Conservation Partnership Program to create partnerships between the Natural Resources Conservation Service and local entities. These partnerships would support the resource assessment, planning, outreach, technical assistance, monitoring and evaluation needed to effectively target and implement watershed-based projects. The partnerships should also work with farmers using funds reserved from EQIP and CSP to enhance source water quality and the recreational value of lakes, rivers and streams. Farmers have been able to choose between 350 individual practices in EQIP since 1997 and 200 individual enhancements in CSP since 2010. Far too often, these programs are implemented cafeteria-style. Farmers pick the measures they like best and the USDA tries to pick the offers that appear to do the most good. Instead, USDA conservation programs should only spend money on practices that are the most effective ways to curb the most important causes of serious threats to public health and quality of life. The choices offered to farmers should be limited to that much smaller set of practices and enhancements. 1. Targeting funds to the most critical problems or promising opportunities by tightening the definition of “priority resource concern” to mean the cause of a specific impairment that threatens public health or quality of life through degradation of air or water quality, or impairs natural resources including water supplies, soil, fish and wildlife. 2. Focusing program resources more tightly by limiting the number of priority resource concerns that can be designated within a local watershed or specific natural resource boundary to five or less, and tightly coordinating those designations between EQIP and CSP. 3. Providing financial assistance only for those practices and enhancements that most effectively address a designated priority resource concern. 4. Focusing CSP enhancements through conservation activity bundles – a set of related and complementary conservation activities that, when implemented together, will meet or exceed the stewardship threshold for a priority resource concern. 5. Capping CSP payments for existing conservation practices and activities to 20 percent or less of total payments, and capping annual payments at $40,000 for persons and legal entities, including joint operations and partnerships. 6. Limiting total payments under all EQIP and CSP contracts entered into by persons or legal entities to $200,000. 7. Concentrating conservation dollars in cooperative projects designed to get landowners working together to put the right conservation practices in the right places. 8. Reauthorizing the Regional Conservation Partnership Program and providing $500 million annually from the Commodity Credit Corporation. 9. Using RCPP funds to drive and empower cooperative conservation partnerships between NRCS and local entities that will strengthen and enhance their capacity to support local projects with technical assistance, resource assessment and planning, outreach, monitoring and evaluation. Using the authorities and funding of all conservation title programs to assist producers implementing the conservation practices and activities identified as the most effective in achieving the objectives of the cooperative conservation partnership. Authorizing NRCS, FSA and project partners to implement conservation title programs in innovative and strategic ways that are tailored to the landscape and farming systems in the project area. 10. Strengthening and expanding the USDA’s Conservation Loan Program to create a no- or low-cost revolving loan fund to subsidize the capital-intensive projects, which include building structures and buying expensive equipment, that account for 61 percent of EQIP spending. Moving those projects to a loan fund would free up a portion of the $455 million spent in 2015 on such practices. The payments a person or legal entity can receive to implement structural practices should be limited to $100,000 from all EQIP contracts held by the person or legal entity over five years. Between 2007 and 2014, as crop prices boomed, landowners took 15.8 million acres out of CRP. That adds up to $7.3 billion in rental payments that created no lasting change. The money spent on those short-term rental contracts would have been much better spent on long-term easements. Taxpayers would still have something to show for the billions they instead spent on renting land for a few years. Congress should ramp up funding for the Agricultural Conservation Easement Program and authorize a suite of more flexible easements designed to protect more types of sensitive land. 1. Authorize easements in ACEP to restore and protect riparian corridors and floodplains. 2. Authorize partial interest easements that purchase a limited set of property rights, and allow compatible economic uses to increase participation and reduce the cost of easements. 3. Require landowners enrolled in agricultural land easements to meet, at a minimum, the conservation standards in the conservation compact. Congress should increase the acres enrolled in CRP through special initiatives and reduce the acres enrolled through general sign-ups. 4. Maintain 25,000,000 acres in CRP through 2023. 5. By 2023, enroll and maintain 12,500,000 acres through the Continuous-CRP, Conservation Reserve Enhancement Program and the State Acres for Wildlife Enhancement initiatives. 6. Enroll at least 2,450,000 acres through CREP by 2023 with high priority for state partnerships that use easements to provide long-term protection for environmentally sensitive acres. 7. Provide easement authority in CRP, and target the most environmentally sensitive land for restoration and long-term or permanent protection.